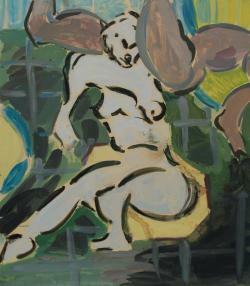 Kate Groobey’s figures are often pictured as if dancing or exercising. 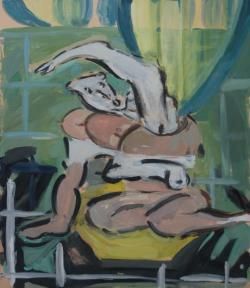 Their strangely contorted bodies suggest movement and an exaggerated flexibility. If their poses seem impossible, it’s because they are: these bodies have been reconfigured several times. Groobey begins each figure as a line drawing, made from life studies, drawn from magazines or sometimes from her own imagination. These drawings are developed as watercolour paintings, which Groobey cuts up, reassembles, and repaints. This process is repeated until Groobey is satisfied with the image. The small study is then translated as a large-scale oil painting to create the finished work. In works such as The Cutting Mat the green background and grid reference the cutting board in her studio. 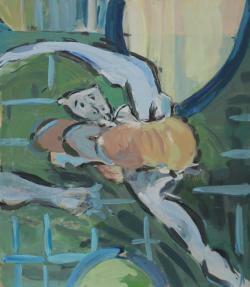 Through her process of painting - cutting up - repainting Groobey’s figures become distorted to near abstractions. With their mismatched body parts and lurid skin tones, her canvases become reminiscent of early 20th century artists such as Picasso or Matisse, and she cites Degas, Hokusai, Georg Baselitz, and Paul Nash amongst her many influences. Groobey draws from this heritage in her fluid painting style which combines large areas of solid colour, accentuated outlines, and expressive gestures. Though her process is very intensive, her finished canvases are done quite quickly, allowing for a sense of spontaneity and play. The Fence, like many of Groobey’s paintings, adopts an earthy palette, using organic blues and greens to make her artificial bodies seem more natural. The play between landscape, figuration, and abstraction is important to Groobey’s work. 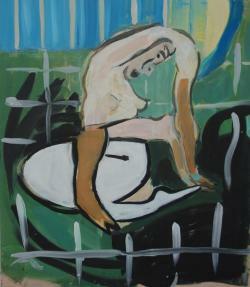 In The Fence the recognisable elements of the painting become almost illusions of the viewer’s imagination. The figure is a mere suggestion of spontaneous marks, a subliminal apparition within a ground of rich colours and textured brushwork. How viewers respond to this painting echoes Groobey’s process: her lush surface provides ‘clues’ or ‘raw information’ for the viewer to assemble and embellish. 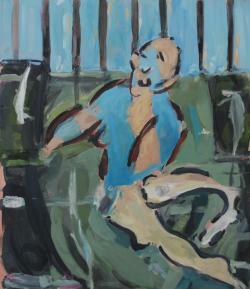 Groobey’s approach to painting is quite physical and takes on a performative element. Because of their scale, her large paintings are made with the canvas positioned on the floor; Groobey has to literally traverse the canvas as she creates the image. 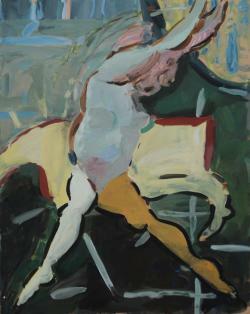 While physically manoeuvring herself in relation to the painted figure, her body replicates the complicated stretching and bending of her subjects. Groobey captures this sense of movement in Horse: her expressive gestures convey a sense of vibrant energy and exertion and in some areas recreate the effect of blurred motion. In Half Lord Of The Fishes the fluidity of Groobey’s paint is at odds with the painful contortion of the figure, and makes the scene seem graceful and poetic, like a ballet. Groobey thinks of her work in relation to activities such as dance, gymnastics, and equestrian dressage, performance-based sports where the extremes of physical and mental discipline are evaluated on the subtleties of aesthetic presentation. Groobey considers her canvases as similar to arenas: competitive stages where her painterly action is pushed to maximum endurance and choreographed to seem flowing and effortless. In making her work, Groobey engages with both psychology and the haptic, knowledge gained from the intimate experience of handling materials. In Bridge Pose the surface is built up with a sumptuous tactile quality that connotes a paradoxical feeling of concrete matter and weightlessness; her forms shift and float about the canvas, anchored only by the grid base background. With an innate nimbleness and dexterity her works describe an area between flight of fancy or daydream and tangible corporeal sensation.